Local borough councils in London have been using their ability to raise money from parking charges to subsidise their budgets - particularly transport programmes including using it to cover the cost of the Freedom Pass. In some cases, they are setting on-street parking charges at a level that is illegal (legally it is very clear that parking charges should not be a “revenue raising” measure). A very extensive report entitled "Profiting from Parking" was published by the ABD in October 2010. It gives the revenues and costs from parking operations, and from "decriminalised moving traffic offences" for a number of London boroughs. It is contained in this pdf document: Profiting-from-Parking. Many London Boroughs suffer from the inadequate provision of off-street parking facilities. This results in heavy usage of "on-street" parking, which can be an eyesore, can also create safety problems and leads to complaints from local residents that they cannot park outside their own houses, particularly where there are terraced houses with no off-street parking. With typically 2 adults in many households, just local residents can overfill the on-street parking and if the street is anywhere near a transport interchange (such as a railway station), or near shopping facilities, the demand on the parking spaces can exceed the supply. a - The introduction of parking meters or "pay and display" systems that limit the maximum number of hours or minutes that you can park, thus deterring long term commuter parking. b - Simple time limits on how long you can park, or the "blocking out" of certain hours (eg. 11.00 to 12.00 am) to deter all day parking. Sometimes these are combined with a "permit parking" scheme so that only permit holders can park in the "blocked" hours. c - A Permit Parking scheme where most of the space is reserved for local residents who have appropriate "permits" which they display. These permits typically have to be paid for (at least so that the administrative costs are recovered but the amount of the fee can also be varied so as to reduce "excessive" demand for permits from local residents). It is also usually possible for residents to buy "tickets" for their visitors which can be used by tradesmen or other people who need to visit them during the day. 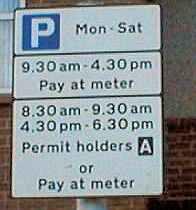 Sometimes these schemes allow anyone to park for free at certain times, but require non-permit holders to "pay and display" at other times as in the example above. They can get very complex to understand! 1. Controlled Parking Zones and Permit Parking Schemes are often an attempt to reserve local parking spaces for residents, when they have no particular rights to such space. There is no moral or legal reason why residents should have priority for parking in roads which are public property. Typically the general public have paid via taxes for the provision of these roads, and they certainly pay for all their maintenance costs, and therefore it seems unreasonable and unfair that a small section of the public should be able to reserve particular road space for their exclusive use. 2. 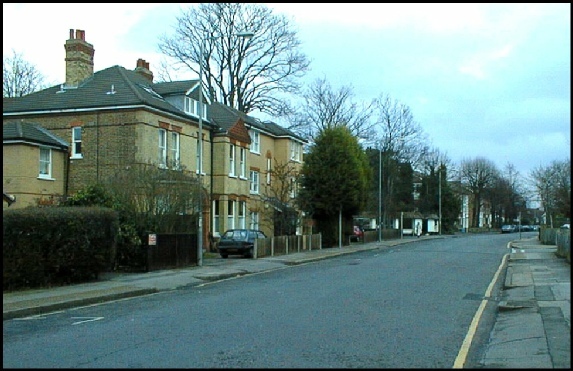 Although, we recognize that residents may have particular difficulty in these areas when they do not have any off street parking (for example because there are terraced houses), most of the residents were fully aware of this situation before they moved into the properties (these problems have been present in London for very many years, while the average residence time for a house in the UK is less than 10 years). 3. These schemes are promoted on the fact that they will resolve parking problems for residents when often they do not (there is no guarantee of sufficient spaces for residents, particularly now that households often own multiple cars). They also mean that residents end up paying for use of spaces which were free before, at considerable cost. 4. They certainly inconvenience non-residents who now may find it impossible to find a parking space within a reasonable distance. This does not just cause a problem for commuters parking near stations. It can also cause difficulties for people making short visits to local facilities such as shops, or simply visiting friends or making business visits (although some schemes only have certain hours blocked out these vary from location to location so unless one knows the area very well it can be difficult to avoid). Unfortunately the spread of such schemes is often motivated by the same “anti-car” mentality that is exhibited in government and Greater London Authority transport policies in recent years, namely that any measures that make use of private cars more difficult are seen as meritorious. 5. In many cases, Permit Parking Schemes result in the under utilisation of available parking spaces. The picture above shows this effect in Upper Park Road, Bromley where the permit controlled spaces are not occupied by permit holders during the day, but nobody else is allowed to use this space. 6. These schemes have a considerable administrative overhead. In fact the only real financial beneficiaries of the schemes are council staff who are employed to administer them. Typically the employment of people to design, implement, operate and enforce these schemes is a totally unproductive task which simply ends up being a general tax on residents. 7. In the case of areas where commuter parking is a problem, these schemes do not solve the problem - they simply move it a few streets away or to another station area altogether. In the extreme case, they deter people from using rail transport with the end result that people drive all the way, which is surely not a sensible thing to encourage. 8. Permit parking schemes are often sold to residents on the premise that only administrative costs are covered and no profit generated from them, but this is not true. In summary, it would in our view be much better if the time, effort and expense put into these schemes be used to develop appropriate off-street parking to meet the reasonable demands of all existing parking users.